There are a lot of HVAC controls on the market and case studies show casing the money saved by installing the equipment. But there is one important question that building owners and managers aren’t asking or not aware that they should ask. What if the building systems were never commissioned or if it was, what if it hasn’t been balanced or maintained since installed. Over and over again I see advanced HVAC controls are being marketed as a quick fix to lowering energy bills. I was at a building the other day. It was a 6 story multifamily residence with one pipe steam system. The steam is produced by an oil fired scotch marine boiler with a setpoint of 5psi. After briefly speaking with one of the members on the building’s coop board I learned that many of the radiators in the apartments have not been maintained and the venting of the distribution had not been done in a very long time. During inspection of the basement there were missing, broken and painted over master air vents. Yet with the help of incentives from an energy efficiency program they are on track to install thermostatic radiator control valves. It is rather frustrating to know that controls are scheduled to be installed in this building without first ensuring that the boiler is supplying the right steam pressure and the distribution is balanced (steam is reaching all the radiators at approx. same time). Additionally, failure to address operations and maintenance issues will result in poor performance or damage of the newly installed controls. Occupants will associate heating problems and discomfort with the new controls. Many coop buildings I have visited had thermostatic radiator valves installed when the technology first came out on the market and didn’t address O&M issues; word spread amongst the coop community that the valves are no good, thus now have a bad rap. Is it easier to receive incentive money on new HVAC technologies and controls than balancing distribution or fixing steam leaks? Or is it the energy consultant who wrote the energy audit and applied for the efficiency program who didn’t know how to quantify the savings associated with adjusting burner controls to provide a lower steam pressure and adjusting master venting and radiator vents for balancing the distribution? What’s wrong with the unit in this picture? 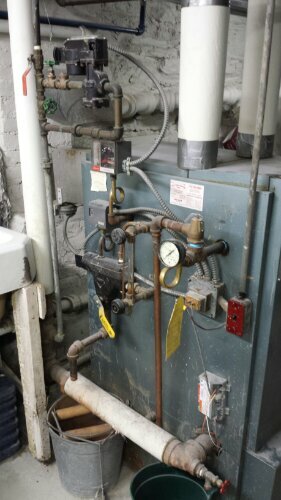 I recently visited a townhouse on the Upper East Side of NYC to conduct an EDR calculation for a steam heating replacement. When I visited the basement to look at the unit needing to be replaced I noticed a couple of interesting existing issues. Would love to start a discussion on steam units people observe in NYC.